Most of the group goes horseback riding the following day, May 13, while a few of us decide to take a chance on a slim forecast and drive to northern Oklahoma to stare at a few white clouds. Along a road that looks like Prairie Stop in "North by Northwest," The Bild reporter tries to melt his ice cream. The Bild photographer snaps pictures. 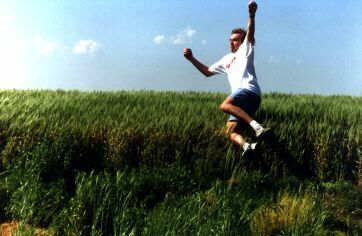 Casey makes phone calls and jumps into a wheat field. Charles plays with his web site and computer games. Steve stares at the sky. Another German journalist, who has joined us for just a couple of days, sits in a dusty gully. I throw a little balsa-wood plane and run to retrieve it, only to screech to a halt in front of an enormous snake. We all gather around. It's a rattler, all right, but it's lost its rattle. After some rather foolish teasing by Steve, it slithers off into a wheat field. The next day, at last, we have something to chase. 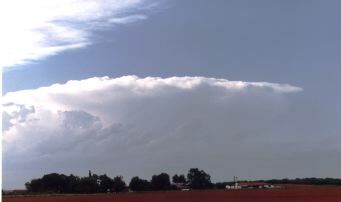 We end up west of Abilene, with towers going up to our north and west. It looks as if someone has declared nuclear war on the Texas panhandle. A large, crisp anvil -- the rounded, flat crown of ice crystals blown off the top of the storm -- looms in front of us, filtering the sun. We know we're not going to see a tornado, so we stop for a hurried conference by the side of the road. We decide to sample some hail, and choose a storm. We end up between the storms instead, and they are the most dazzling of the trip. Serendipity guides us. The fabulous sunset sets afire both monster clouds, as rain hangs like feathery mist from their dark bellies. Mammatus clouds glow orange, and lightning forks to the ground and crawls across the sky. A breeze carrying fresh, brisk air whisks through our group. Charles and Lan set up cameras and shout ecstatically when the lightning bolts cooperate with their shutters. I take pictures until I run out of film. As night falls, on the way to yet another Motel 6 in Lubbock, we stop to view a stupendous sight: an LP (low-precipitation) rotating storm. It is dark, cool and windy, but a slender moon dimly lights the striated clouds, and the anvil cuts a disclike edge into a clear, starry sky. For a moment, it looks as if the storm has lowered a wall cloud, and Lan and Casey drive off to get under it in a frenzy of excitement. The lightning illuminates it only rarely, but we are all tense for a few moments, thinking it may produce a tornado. It doesn't. As the storm loses its structure, we drive away, and it follows us like the figurehead of a ship, a giant mermaid lit by the stars and the moon, her hair and tail streaming behind. Lightning sparks from her base as she flies, a giantess of air, vapor, mystery and power. The Germans mutiny; they want to return to Norman to spend a last evening together before half the group departs. So the next day, Casey takes me and another hanger-on, Allan Rosenberg, storm-chasing. 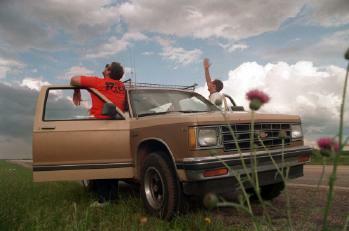 Allan, a lawyer, is the creator of a storm-chasing comic that is only available on the Web. Our luck is not good. We pass through a minor storm coming out of Lubbock, and the only rotation we see all day is a dust devil. But as we drive across austere, open land in north Texas, the sky is like a meteorology class, full of variety and beauty, and the roadsides are profuse with wildflowers. And somewhere, on a lonely road outside nowheresville, we see a rainbow. Back in Norman, I visit with my fellow tourists for a while before succumbing to exhaustion. Steve, a brilliant mind but not a brilliant cruise director, has quit the tour after being driven to distraction by the Germans.